As I have mentioned before, the old story about "Wheat" being the initially intended pattern for Corning Ware, and how the pattern was not ready for production so the Cornflower was used instead, has long been shown to not hold any water. (because there are blue wheat prototypes out there - it's possible the enamel color wasn't "ready") The "limited number of pieces" claim has also been refuted several times. This percolator's existence only backs up the fact that "small number of pieces" is completely false. Though I admit, I have been searching for some trace of it's production for several years.... 3 actually showed up within a 1 month span on eBay.... So it's not a "one of" scenario. Just as the W-53 Self-Timing saucepan proved that Wheat had been in production from at least 1963 (the only year those were made); the existence for the 1st generation Electromatic Percolator W-23-EP (Along with its other 1sts gen brethren; Trefoil P-13-EP and Cornflower P-23-EP) proves that wheat could have been in production as early as the fall of 1961. 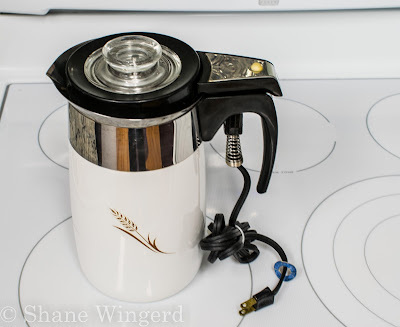 Though not as common as the latter model (P-80-EP and P-6-EP from 1966-1972) let it be known that these older percolators DO, in fact, exist. This corning ware is something new for me,haven't seen it before.Its kinda cool I must say.Please guide me from where I could purchase it?